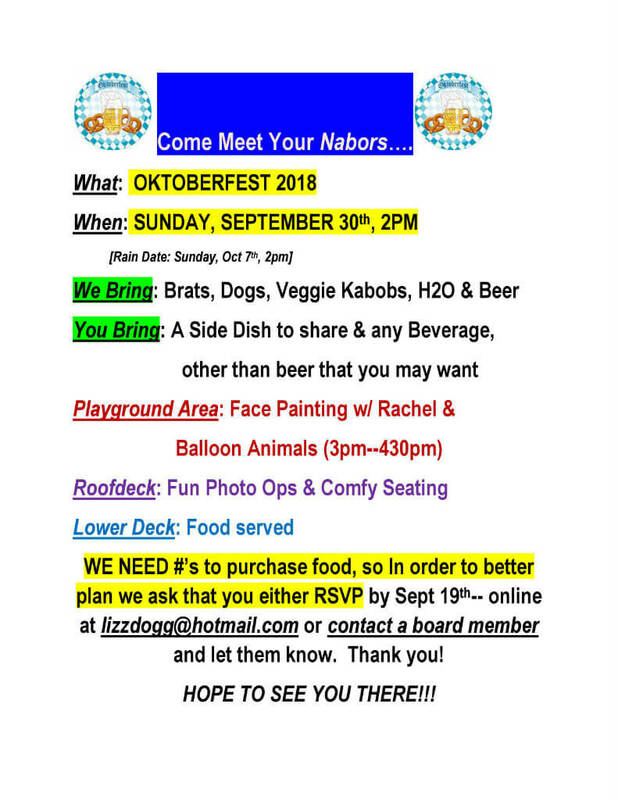 News | NaBors Apartments | A great place to live! This entry was posted in Co-op Communications on 4 September 2018 by Webmaster. We need numbers to purchase food, so in order to better plan, we ask that you either RSVP by 19 September—online at or contact a board member and let them know. Thank you! This entry was posted in Announcements on 26 August 2018 by Webmaster. This time it’s a cook-out/potluck gathering! We’ll have the grills ready to roll. 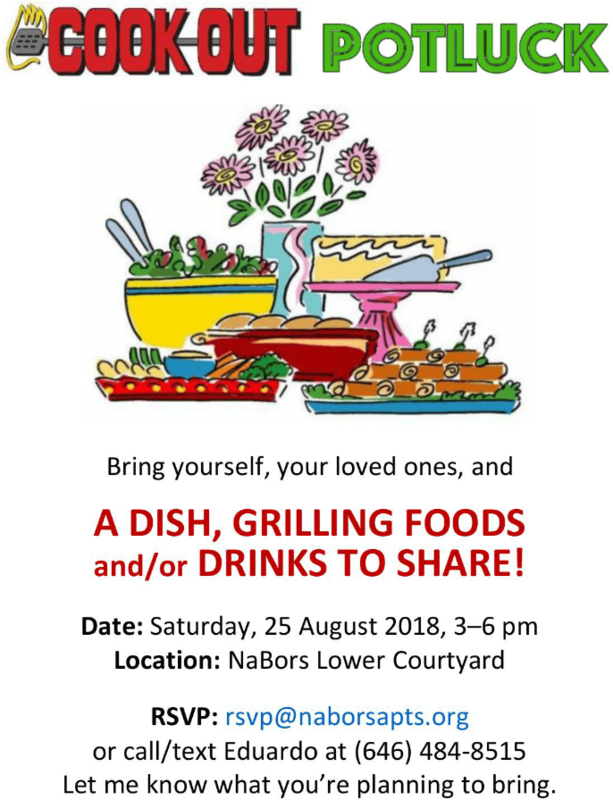 Meet your NaBors and share good food, conversation, music and merriment! A DISH and/or GRILLING FOODS and/or DRINKS TO SHARE! In your message, please let us know what you’re planning to bring. This entry was posted in Announcements on 18 August 2018 by Webmaster. Below is a list of the shareholders elected to the Board of Directors at the 2018 annual meeting of shareholders, to serve until the 2019 annual meeting. This entry was posted in Co-op Communications on 6 July 2018 by Webmaster. To: All Shareholders of Nagle Apartments Corp. Enclosed you will find the Notice of Meeting for the Nagle Apartments Corp. 2018 Annual Meeting of Shareholders. Please fill out the proxy and mail it or fax it to my attention to ensure we have a quorum for the meeting. If you are going to attend the meeting, your proxy will not be used. If you wish to run for the Board, please send a bio to my attention so it can be distributed to the shareholders before the meeting. I should be in receipt of this bio no later than Friday June 8th in order to have it distributed prior to the meeting. You can still nominate yourself at the meeting or prior, but if a bio is not received before June 8th, it will not be made available to shareholders until the day of the meeting. You are encouraged to include a picture or headshot. The bio can be emailed to and should be in Word format. This year’s meeting will be held in the courtyard of the Nagle Apartments, New York, NY 10040. Food and refreshments will be served starting at 6pm. I look forward to seeing you all there. Please contact me if you have any questions. This entry was posted in Co-op Communications on 15 May 2018 by Webmaster. The following is a reproduction of a memo dated 20 December 2017, distributed by management to all shareholders. View/download PDF of the scanned memo. 2017 was a quieter year in terms of large projects after having done the building roofs, garage roof deck, and garage interior over the previous 4 years. In 2018 the focus will be on the lower courtyard and developing plans for a remodel of that space as well as looking into renewable energy sources, particularly Solar Power. In order to deal with anticipated increased costs in insurance, real estate taxes and other operating costs, the Board of Directors has voted to increase maintenance costs by 2.5%. Real Estate tax increases is the largest factor considered. The corporation fights the assessed value every year but it remains the single largest uncontrollable operating expense. In addition, the current capital assessment will continue as 10% of the monthly maintenance. This makes the total increase of 2.75% total cost per shareholder for the year 2018. The assessment continues our goal of 10% to meet federal banking regulations. Those regulations require us to maintain at least 10% of total maintenance as part of our reserve funds for capital expenditures. So as not to overly burden our shareholders, we have consciously kept our maintenance increases small and gradually built to this 10% goal over the last few years in order to meet these regulations. The 10% assessment is not temporary, it is an important part of permanent prudent financial planning for the coop and assists us in funding necessary capital projects such as the courtyard. The Board of Directors, the staff and management wants to wish each of you a fantastic holiday season and a safe, healthy and prosperous 2018! This entry was posted in Co-op Communications, Financial on 20 December 2017 by Webmaster. The following is a reproduction of a notice posted on the co-op’s bulletin boards. View/download the notice (PDF, 40KB). Below are the directors elected to the Board of Directors at the 2017 Annual Meeting to serve until the 2018 Annual Meeting. This entry was posted in Co-op Communications on 31 August 2017 by Webmaster.